Dr. Ralph F. Wilson has had a life-long interest in art. As the son of a high school art teacher, he spent many hours as a boy watching his father paint and trekking through the art museums of San Francisco. In 1993-94, he took classes in drawing and graphic design at Sierra College. At that point, color and composition found expression in website design and graphics, and later, in book cover design. 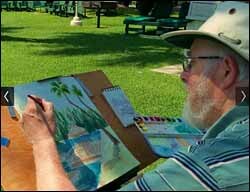 After he retired, Ralph found time for his long-time desire to paint watercolors -- just as he had seen his father do many years previously. In the fall of 2012, he began with a basic watercolor class at Sierra College, followed by a series of classes at the Placer School for Adults in Auburn -- Intermediate/Advanced Watercolor with Sonja Hamilton (Jan 2013-Dec 2014) and portrait painting and figuring drawing with Bobbi Baldwin. Also studied under Pat Abraham (Jan 2015 - May 2017). He's currently studying with Sonja Hamilton to learn more about wet-on-wet techniques (Sep 2017 -). Here are some of his newest paintings and an artist's statement. Ralph and his wife Jean live in rural Loomis. He is a retired pastor and Internet marketer. In the 2018 WASH Open Show, "Awash with Color," at the Sacramento Fine Arts Center, two paintings were juried in: Shops in the Shadow of Oude Kerk (Old Church), Delft and Family - Goose, Gander, and 19 Goslings. "Fish Carts at Monterey Wharf" won Best of Show at the "Awash with Color" WASH Members Show at Sacramento Fine Arts Center, April 3-22, 2018, jurored by Jeannie Vodden. Two other paintings in this show are "Kayak Konvocation" and "Peeking at Lincoln Cathedral." "Fingers into the Pacific - the Sonoma Coast" was exhibited as part of the Auburn Art Walk at the Placer County 'Domes' administrative building Oct 13 to Nov 16, 2017 with others from Sonja Hamilton's Thursday watercolor class. 2017 WASH "Go with the Flow" Open Show, September 5 to October 1, 2017 -- "Yucca Spikes" and "Dawn at the Auburn Courthouse." "Colonnade at San Juan Bautista Mission" won "Painting of the Month" at the WASH Watercolor club monthly meeting for April 2017. "Shopping in Lincoln, England" won for October 2017. "Awash with Color" juried WASH Member Show April 4-23, 2017 at Sacramento Fine Arts Center. "Odd Egg" won an Award of Merit. Also exhibited was "Full-on Red Rose". In the juried "Go with the Flow" WASH Open Show at Sacramento Fine Arts Center, September 6 to October 1, 2016, -- "Feverfew" and "The Cliffs of Drake's Bay." 'Golden Center - Pink Chrysanthemum' was juried onto Magnum Opus XXVII, Sacramento Fine Arts Center's Annual Open Show, July 19-August 13, 2016. 2016 WASH Member Show, "Awash with Color," at Sacramento Fine Arts Center, April 26-May 14, 2016 -- "Colorful Zebra," "Sing Praises," and "Green Valley, Novato Hills" (which won Honorable Mention). 2015 "Go with the Flow" WASH Open Show at the Sacramento Fine Arts Center, Sept 1-26, 2015 -- "Granddaughter Reading" and "Bluegrass Banjo." Placer County Fair, June 25-28, 2015, "Soft Dogwood" won first place in the watercolor category, "Tranquil Tahoe" won third place. Also exhibited "Autumn Backlit." Placer Artists League Open Juried Show, Auburn, June 2-20, 2015: "Prickly Milk Thistle." 2015 "Awash with Color" WASH members show, Sacramento Fine Arts Center, March 31 to April 18, 2015. "Lavender Bluebells," won "Honorable Mention." Also exhibited: "Pac-Man Breakfast" and "Soft Dogwood". "Animal House" show at Sacramento Fine Arts Center, February 18-March 9, 2015, "Baa! More!" 2014 "Go with the Flow" WASH Open Show at Sacramento Fine Arts Center, Sept 2-27, 2014, "Waiting for Crumbs" and "Palace Swans." Placer Art League Open Show at the Lincoln Art Center, July 2 thru Aug 2, 2014. "Yellow Iris" and "Waiting for Crumbs". Colfax Art Walk, May 9, 2014, solo exhibit. Auburn Art Walk, April 10, 2014, exhibited with Sonja Hamilton's students: "Chinese Hanging Tiger Lilies." 2014 "Awash with Color," Sacramento Fine Arts Center, WASH Members Show 2014, April 1-19, 2014: "Gulls at Close of Day" and "Asilomar Beach at Sunset." Snowflake Exhibition 2014 juried show, Rocklin Fine Arts, Feb 8-9, 2014: "Autumn Backlit." "Along the Lincoln Highway," Auburn Arts Commission, Dec 12, 2013 to Feb 7, 2014, "Rainbow Bridge above Donner Lake" and "Blue Goose Fruit Shed, Loomis, California, ca. 1930". "Go with the Flow, Sacramento Fine Arts Center, WASH Open Show 2013, September 3-28, 2013, "Yellow Iris, "Tranquil Tahoe," and "AIDS Orphans, Kenya." "Celebrating Auburn's Past," Auburn Arts Commission, June 12-Aug 1, 2013: "Auburn's Crown Jewel." Placer County Fair, June 20-23, 2013. Won Best of Division in the Two-Dimensional Art Division, and 1st and 2nd place in the Watercolor Class, "Yellow Iris" and "AIDS Orphans, Kenya," respectively. Auburn Art Walk, "Classic Chrome and Rust" exhibited with the students of Sonja Hamilton, April 11, 2013: "Model T Brass." Snowflake Exhibition 2013, Rocklin Fine Arts, January 26-27, 2013: "Dappled Bayou."